KayKiSpeaks.com: Finally: Justin Timberlake and Jessica Biel Wedding Photos! Finally: Justin Timberlake and Jessica Biel Wedding Photos! How gorgeous is Jessica Biel? Safe to say she has Justin Timberlake jumping for joy in the first photo from their wedding. The wedding was kept hush hush until after the fact. From the sound of it, the occasion was incredibly beautiful and fun! I wouldn't expect anything different from this couple. Biel's gown in the above photo.. a soft pink-was beautiful! Designed by Giambattista Valli, the gown is incredible... silk mousseline and silk organza. The smile on her face says it all as JT is jumping (literally) with excitement in the background. He's giving me Tom Cruise excitement in this cover of People Magazine. 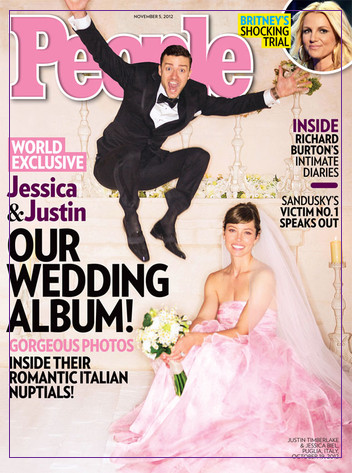 Timberlake reportedly sang a song he'd written just for Jessica at the wedding which he described as "magical". So exciting to see a couple who's been together so long finally take the leap. Now.. JT .. for some new music...............?! People Magazine had to put Britney Spears on the cover for good measure. Very funny! But I love this couple! Wanna See @NeneLeakes in a pool of Diamonds?! @ChrisBrown BOYYYYYYYYYYY What are YOU doing?! Rihanna Premieres Album Cover & Title!! I am REALLY loving Miley Cyrus' New Hair!